WestJet is a Canadian discount airline that offers the chance to save on travels without forgoing customer service and in-flight creature comforts we've all come to expect. The company is the second largest airline in Canada, second only to Air Canada and the ninth largest airline in North America by passengers carried. % off base fares when you use your WestJet promo code. % off select destinations when you apply your WestJet coupon. Get extra WestJet rewards when you book your flight and use your WestJet coupon code. In addition to discounts on WestJet flights, we post the hottest WestJet vacation deals, seat sales and other offers from the airline. Click on the deal you'd like to use from this page and copy the code. 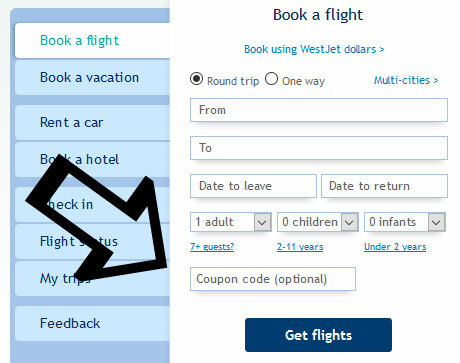 On WestJet.com, enter your flight specifications into the "Book a Flight" box on the homepage. At the bottom of the box, find the "Promo Code" field and paste your code. Click "Get Flights". Your coupon will be automatically applied to the flight prices displayed in the search results. Travel across Canada, the United States, Mexico or the Caribbean with one of Canada’s leading airlines. Westjet makes travel easier and we’re here to make it even easier with savings off your next flight. Take a vacation with the whole family for less.